Kathleen Shannon of Braid Creative (the duo that did the branding for Brené Brown) is on the latest episode of The Solo Creative Podcast talking about branding and facing your fears. Read more "Kathleen Shannon of Braid Creative on The Solo Creative Podcast"
Read more "Skip Cohen on The Solo Creative Podcast"
The second podcast from our Dare Dreamer FM network launches today. Authentic and down-to-earth advice for creative solopreneurs. Education, insights and inspiration on sales, marketing, branding, social media and making a living at what you’re passionate about. Read all about it (and listen to the introductory episode) at http://daredreamer.fm/solocreative-intro/. Read more "The Solo Creative Podcast is Now Live"
To prepare for exciting changes ahead, my new primary Twitter handle is now @DareDreamerFM. If you were already following @DareDreamerMag, you don’t need to do or change anything. Read more "My New Twitter Handle is @DareDreamerFM"
This is by far one of, if not the most challenging project I’ve undertaken. A sound-rich, storytelling-driven, documentary series podcast about filmmaking. The first full episode is now live. Subscribe in iTunes. You can listen online and read more about it at daredreamer.fm/rfs001. Read more "Radio Film School Officially Premieres"
Get notified when it does. This quote from Joseph Campbell pretty much sums up how I’ve been feeling lately. Lots of new and exciting things coming down the pike, and I have no idea where it might take me. Just going one step at a time. Sign up if you want heads up when everything hits. Perhaps the biggest and boldest challenge I’ve ever given myself. 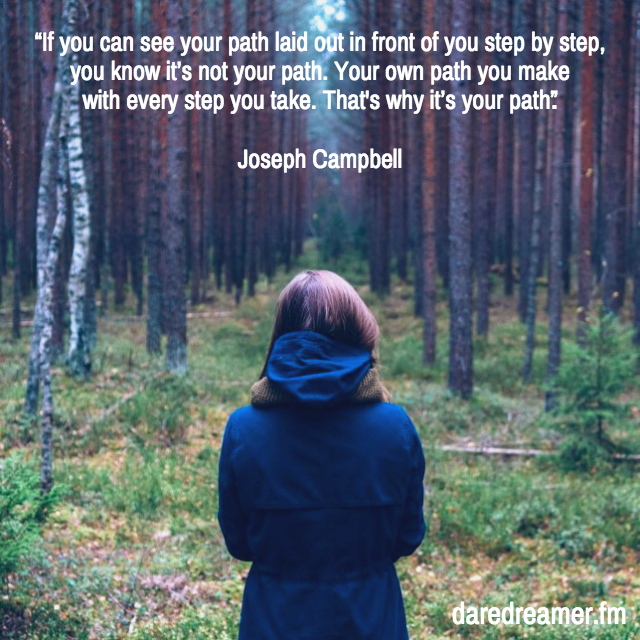 Read more "Following Your Own Path"